Happy Monday lovelies, how was your long weekend, did you buy something interesting on Black Friday? I don't know about you but my Black Friday is all about online shopping. I prefer to sit on my couch and look for great deals peacefully, than go to a mall, struggle to find a parking spot, and then, once I'm inside the building, try to pass the crowd so that I can somehow get to my favorite stores where (after hours of looking for those perfect pieces of clothes or cosmetics,) I will need to stay in a long line... No thanks __ I rather stay home and shop online. Those of you who dear to go to malls on Black Friday, you are my heros. Obviously, I did quite some damage to my credit card (haha) but the worst part for me is that now I have to wait until I receive my packages and until I see what I spend money for. OK, enough about Black Friday, let's talk about this outfit that I was wearing few weeks ago. It was early morning, it was very windy and so cold that my hands became ridiculously red, but still, I refused to wear jacket, haha. Love the ombre puff jacket! Really looking forward to cyber monday deals! Your look is cool and perfect for fall! You're welcome, enjoy the rest of this week! I love the look of your puffer vest! It just looks so cozy! Love this cozy chic look! I adore your vest. Such a beautiful outfit! Love that vest! great fall outfit and I love that little bag! You look so pretty in this jacket. You have styled it perfectly. This vest looks so cozy! I love the unusual color! A vest keeps you warm and cozy in fall. Very fabulous look! such a fun vest! you rock it! 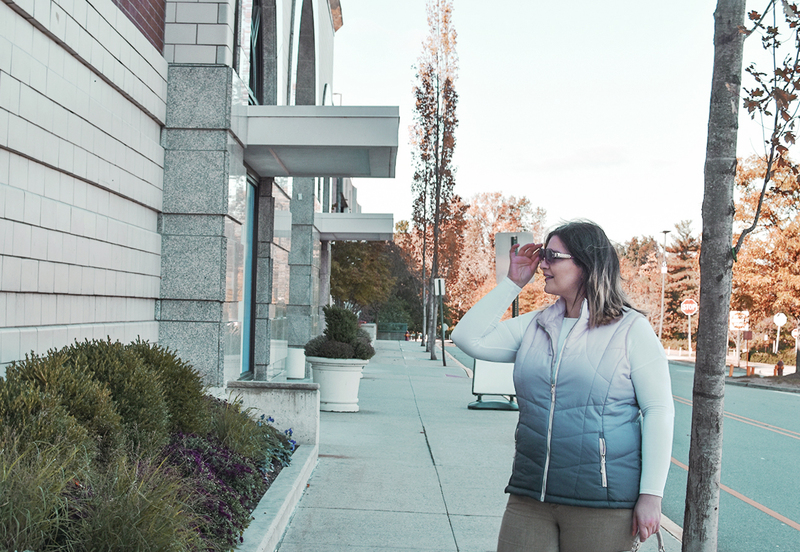 Puffer vests are the perfect transition to colder weather. Nice post! 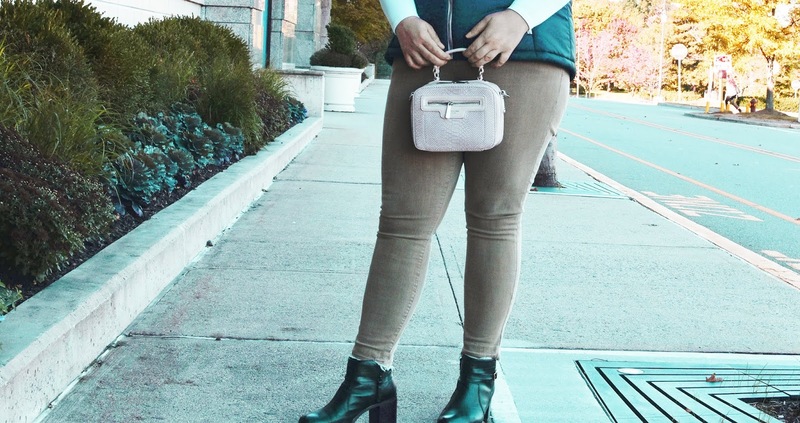 Cute post, a puffer vest is great for the season. Also super stylish! No I do not shop on Black Friday or Cyber Monday, though I did get two gifts on sale at Macys Wednesday evening as the sales at already started. I have friends that get up at 4:00 am and leave at 5:00 am to shop--they don't work. I do, I sleep in hahaha. That puffer vest is so fun, love the ombre effect. Such a cute bag and the puffer looks great! Lovely vest dear! I love the color, so cool to look at. Love how you paired it with those classic shoes too. The vest looks so cozy, dear! Love this winter look! This outfit is so cute! I absolutely love that puffer vest...the ombre design is so pretty! We don't have black Friday here in Australia but I do most of my sale shopping online - I'm not good with crowds, and it's easier to find sizes online anyway! Hope you love everything when it arrives in the mail! Love this vest. The ombre effect looks unusual on this type of garment. I love your ombre puffer vest! You look so cozy and chic. I did some Black Friday shopping too and I always like to shop online. There's just nothing better than being able to shop from the comfort of your own home! I agree, it's so much more comfortable to shop from home. Happy Tuesday dear. Looking good girl! Love the jeans! Gorgeous outfit, vest and lovely boots. Love the puffer vest. So cute!! I love your fashion style. Everything looks pretty good on you. The puffer vest is so beautiful and suits you perfectly. nice ond and ideal for the colder days. You are looking so pretty, I love this outfit. So cute, I love your puffer vest!